Registration opened for the Mackinac Retreat on January 17th. I'm not sure how registration is going as the staff are all at TNNA in Phoenix. I would have liked to have gone but TKGA does not have a booth at the winter show, only the one in June in Columbus. Also, I really try to minimize how much I travel in the winter. I have a knack for booking a seat on flights that are delayed or cancelled. I have spent many a night in airport hotels and it is worse in the winter. The "official" policy from TKGA is that students have a year to complete the course. This policy is necessary mainly when there is a change in teachers so the prior teacher isn't getting lessons five years after they have retired. I do not enforce this policy. As long as I am the teacher, I am willing to continue review your work. If more than a year has passed, let me know so I can send you the latest version of the course materials. I do think you have a better chance of completing the course if you start right away and try and do each lesson as soon as you get it but I know that life intervenes and we all have responsibilities to others. This tip is a continuation of the tips from the past two weeks. Lesson 3 of the Basics Class and all three levels of the Masters program require cable work. Two things can contribute to the sloppiness of cables: ladders and stretched out stitches. You can see there is a ladder on the left side of the cable. Not only is this ladder unattractive, it can also change the gauge of a piece. 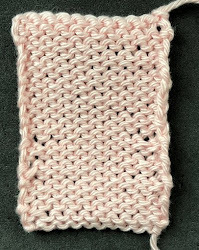 Compare the left side of the cable to the right side and you can see there is no ladder to the right and the knit stitches are the same size as those to the left. This is caused by the same thing that makes ribbing and seed stitch sloppy. Remember to pull the yarn forward tightly when changing from the knit to the purl on both the RS and the WS. The other issue is the over sized stitch in the cable cross. Anytime you slip a stitch from one needle to another, you run the risk of stretching that stitch out. 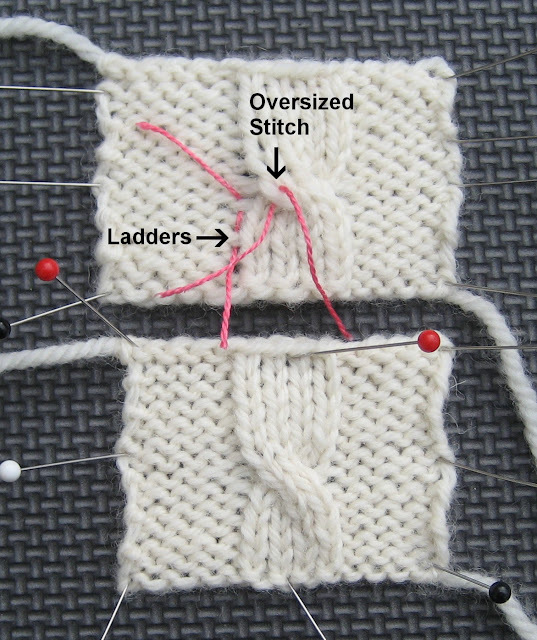 When a stitch is stretched out it generally stays stretched out. When you are slipping a stitch, try to manipulate it as little as possible and use just the needle tips. This minimizes the distortion. If you notice a stretched out stitch on a previous row, you can use a tapestry needle to try and pull yarn from the large stitch to the surrounding stitches. There is a UK basketball game Saturday at noon at Rupp arena so Salon will be on Sunday. The real reason Salon will be on Sunday is that there is a Metropolitan Opera HD Simulcast. I try to never miss them as I am an opera fan. This Saturday at 12:55 they are premiering The Enchanted Island which is "new" baroque opera. The plot is a combination of Midsummer's Night Dream and The Tempest. The music is from baroque composers. By the way, if you are ever plan to be in Lexington on a weekend, let me know. There is always room at the table. I finished up the skirt and shell last Sunday and I actually wrote the pattern and did the schematics the next day. My New Years Resolution is to write the patterns as soon as I the garment. I have been know to wait until the very last minute. It can be difficult trying to figure out what you did, 3 weeks after you finished. So far, so good. It wasn't raining or snowing (for a change), just another gray day in Kentucky so I dragged the mannequin to the back deck. The color is a bit lighter but you can see the lace quite well. 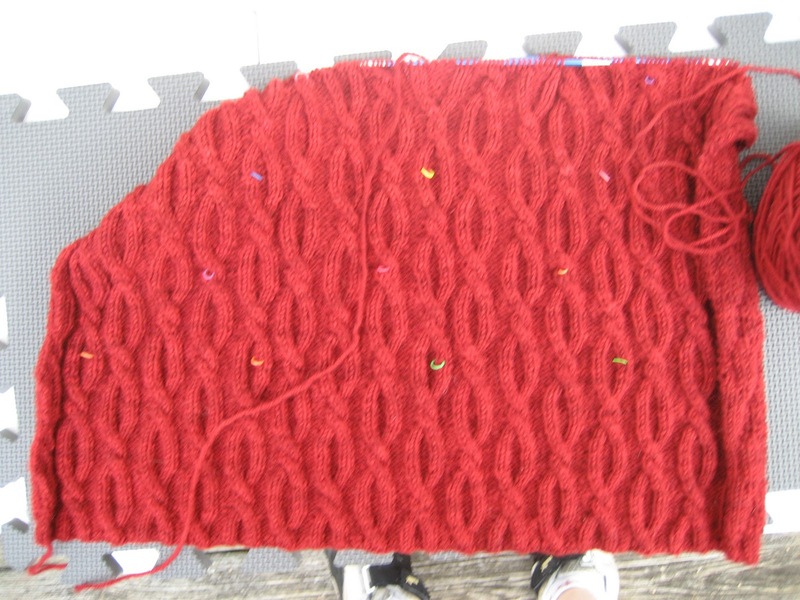 Now I am hard at work on the cabled tunic. I'm using Miss Bab's Northumbria DK. What a change from working with two strands of linen! It is absolutely wonderful. This color is COMPLETELY wrong. It looks orange. The sun came out for a brief moment. The name of the color is Vlad (Dracula's first name) and it is a deep red, not orange. The tunic is wider at the bottom and I had some difficulty in deciding where to do the decreases. I ripped out about 6 inches since I was dissatisfied. The reverse stockinette between the cables reduces from 4 to 2 stitches. If you don't space out the decreases evenly and gradually the drape is wrong. The row markers (dental elastics) remind me where I placed the decreases. The photo shoot is February 15th so I have to get a move on. I also have to finish up over-the-knee striped socks which will accompany an article on jogless joins. I haven't missed a deadline yet! - Ngươi có chắc là mặc áo xám hay không? - Đúng vậy, là áo xám ! - Thiên Vận Tử mặc áo xám, thú vị ! Vương Lâm khóe miệng lộ ra một vẻ âm trầm. Hắn vừa rồi tập trung thần thức vào Đỗ Kiến, lời của người này không giống nói dối. Trong mắt Vương Lâm lóe lên hàn quang.